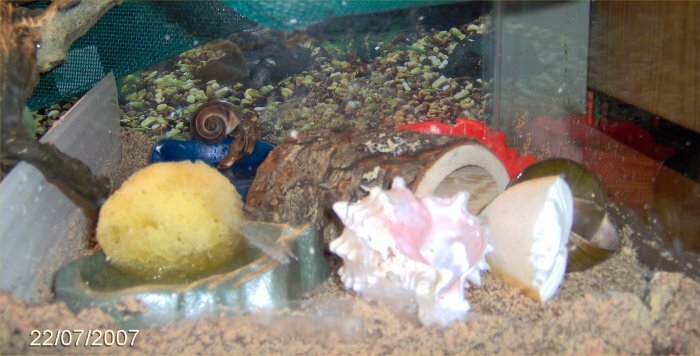 This page is about terrestrial hermit crabs commonly kept as pets. I got a hermit crab on 7/8/07. The information below is a conglomeration of information I have learned from reading a few web sites and books on hermit crabs. I am trying to make a summary of the most important points. I am writing this page off the top of my head so it is original. If you find there is information that is incorrect, or you want to add something, please contact me so I can correct it. This page is not meant to be an all-inclusive guide to hermit crabs by any stretch of the imagination so please refer to the tons of links below on hermit crabs. Many of those web sites are amazingly well done with lots of information and photos. Herman died unexpectedly on 11/23/07. My mother got another crab on 12/9/07. His name was the immensely original name, Crabby. This page is about hermit crabs that spend most of their time on land. I also have a page on marine hermit crabs that never leave the water (about the small species for reef aquariums). There are two species commonly sold in pet stores as hermit crabs. They are Coenobita clypeatus which is called the purple pincer crab from the Caribbean and Coenobita compressus or the Ecuadorian crab. The first kind lives inland while the second kind lives on the beach. The Ecuadorian crabs have elongated eyes while those of the purple pincer crab are round. I think I had the Ecuadorian crab which prefers setups that mimic the beach with saltwater and sand. See this link for how to tell the two kinds of commonly available hermit crabs apart. There are some exotic species sometimes sold as well. Refer to the web site sections for photos, descriptions, etc. of the hermit crab species. 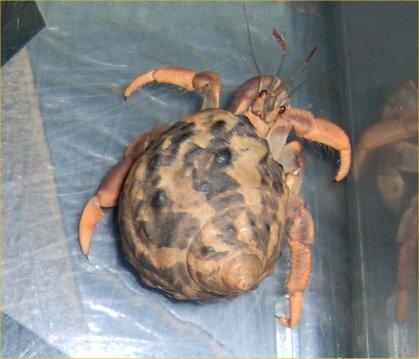 Hermit crabs are nocturnal so do not worry if they do not move around much during the day. At night, they will be all over, getting into trouble! Hermit crabs are gregarious and prefer to be in groups so it is best to have at least two or three. A hermit crab should be kept in a 10 gallon tank or larger with a few hermit crab friends of the same species if possible. 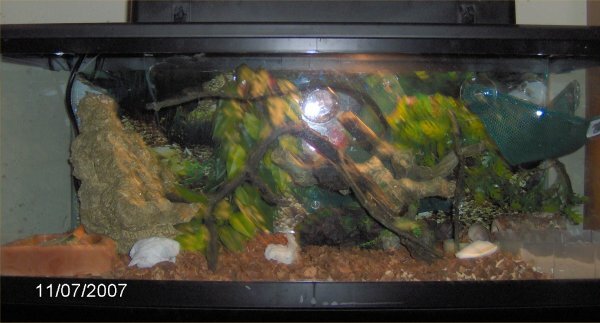 A glass tank with a glass lid is preferable to a wire cage or mesh lid because the glass will hold in the higher humidity that hermit crabs need. Hermit crabs need temperatures from 72-85 degrees F. If they are too cold, they really suffer, slow down, and eventually die. They are tropical animals. It is better to have areas of the tank that are warm and some that are cooler so the crab can chose where he wants to be. If the tank is not warm enough by itself, an undertank heater may be useful to bring up the temperature in the substrate. Although not required, it is a good idea to have a fluorescent light over the tank so the tank is bright during the day as in nature. If the cage is cold, an incandescent heat lamp may be useful but be sure the tank still has areas that are no warmer than 80-85 degrees F. If a hermit crab overheats, it may ooze black stuff and die. The most important thing for hermit crabs is humidity. That is because they have gills. For gills to function, they must remain wet. Experts say to have at least 70-80% humidity in the tank. That can be hard to maintain. Ways to increase the humidity include closing off more of the lid, adding dishes of water and saltwater, adding wet natural sponges, using misters, and keeping damp sand in the tank. 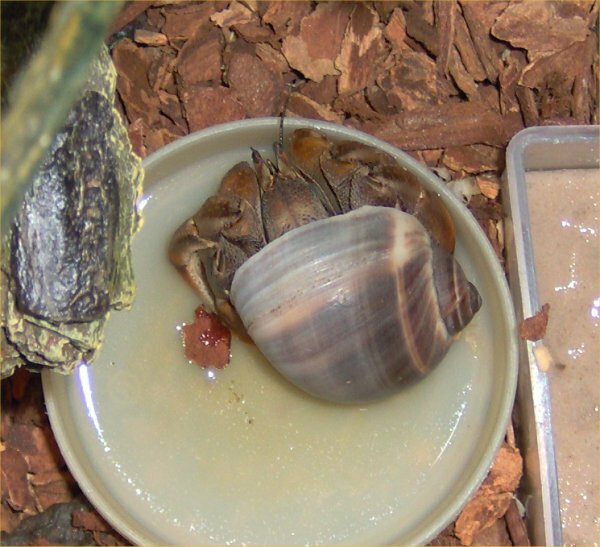 The hermit crab should be able to get itself wet in shallow water especially if the humidity is hard to maintain. The hermit crab's habitat (and crab) can be misted by hand a few times a day, or you can buy a mister (I suggest putting it on a timer so it does not run all the time; try to mimic rain). 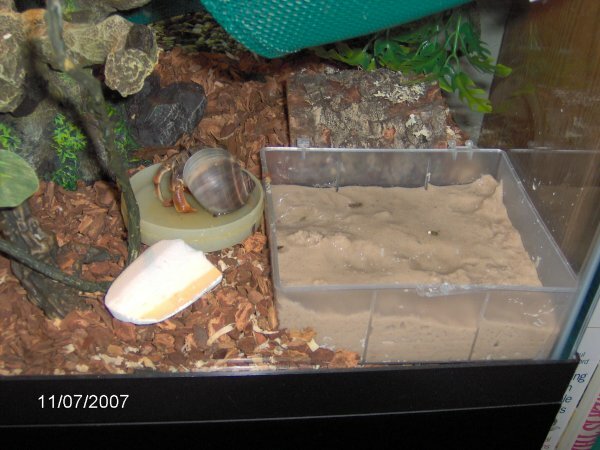 A humidity gauge should be kept in the hermit crab setup; that is how important humidity is. In addition to the cage, lid, two water dishes (freshwater and saltwater), and foods, you will need substrate, things to climb, and shells. The substrate should be able to maintain moisture. The best to use are sand or forest bedding. They should be kept damp but not water logged. For the sand, it should be such that you can make sand castles. When the substrate starts to grow bacteria and/or fungus, it needs to be replaced or sterilized. Hermit crabs love to climb! You can buy real or fake branches and almost anything non-toxic and not dangerous for them to climb on. They will do their best to escape their habitat as well so it must be secure. They can even lift up weak lids to make a run for it. Unlike with snails and turtles, a hermit crab's shell is not part of its body. It is usually the remnants of a dead marine snail. As hermit crabs grow, they will change shells to pick out a larger one. So, shells should be kept in their setup so they can move when they want to. 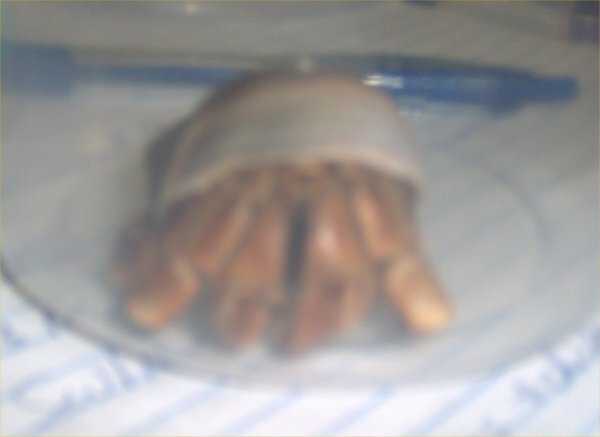 Avoid painted or sealed shells as they do not allow gas exchange through the shell which may overheat the hermit crab inside if he moves in. 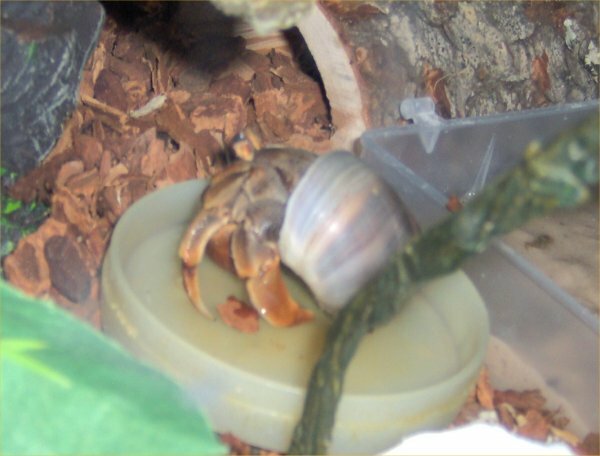 Hermit crabs are scavengers that will eat most anything. Foods to try include commercial hermit crab foods, fish foods, cereals (rice, oatmeal, etc. ), meats (cooked is safer), and fruits and vegetables. Some fruits and vegetables you might try include tropical fruits like mango and papaya (non-citrus fruits), grapes, apples, grated carrot, and greens (kale, green lettuce (not iceburg)). Hermit crabs will eat most anything even leaves, bark, and various unmentionables. Hermit crabs need a good amount of calcium to help build their exoskeletons. Calcium can be added to the diet by crushing cuttlebones in the food, adding reptile vitamins to the food, or from natural sources such as kale. Hermit crabs also should have caretonoids in their diet such as B-carotene. Good sources are grated carrots, mango, and some shrimp. Hermit crabs need a dish of freshwater and a dish of saltwater. They will drink from both to regulate their salt levels. 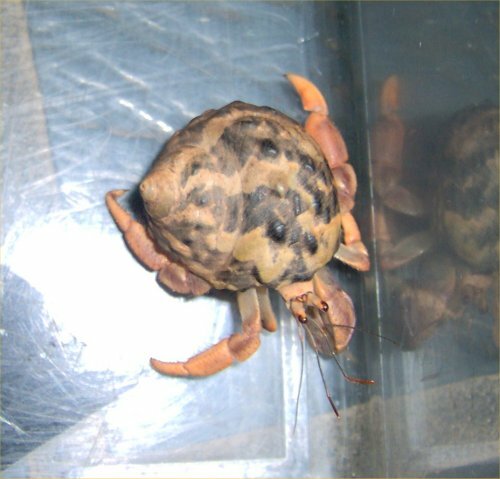 The Ecuadorian hermit crabs will not survive long without saltwater as they are adapted to drink saltwater living on the beach. To prevent the crabs from drowning, it may help to put small stones, pebbles, or a natural sponge in the water. The hermit crabs will spill the water, and it will evaporate. Since the dishes should be shallow (a half inch is fine), they should be changed out daily. It is VERY important that, if you have city water, you need to add dechlorinator to the tap water to deactivate the chlorine or chloramine. Hermit crabs are sensitive to the chlorine and could die. In some cases, bottled spring water may be a better choice. Luckily, I have well water so this is not an issue. Here is a detailed page on sexing hermit crabs. No matter what sexes of hermit crabs that you have, you need not worry about breeding. Females release their eggs into the ocean where they live for quite a while. They do not look like crabs at that time, hanging out with the plankton. This cannot be replicated in captivity. I do not know if the hermit crabs still court, mate, and lay eggs in captivity, just that no viable young will result. Food and water dishes should be dumped, cleaned, and refilled daily. The substrate should be cleaned or replaced if it looks dirty. The entire setup should be fully cleaned every few months. Here are some books on hermit crabs. I do not have any of these so I cannot give my opinion on them. Get a free catalog from That Pet Place by calling 1-888-THATPET. They sell some hermit crab supplies. On 7/8/07, my mother asked me if I wanted anything at the deli when she was out. I said that the aquarium store was near there, and my African dwarf frogs needed some live blackworms. When she got home, she said, "You know you shouldn't send me into a pet store." Ut oh! She had bought a hermit crab of all things. I had never had one nor was I interested in one. She claimed he would take no extra time beyond my other tons of animals. She said he could live in the 20 gallon tank with my two anoles, the roaches, and crickets (in there to feed the anoles). I doubted it but gave it a try. The point (to her) was to not give me any more work to do. She named him Herman after her grandfather. I did not know if Herman was male or female but I will refer to him/her as male. So, what were the problems associated with Herman's arrangement? First, compatibility may have become an issue at some point. After a week, there was no sign that the anoles, roaches, or crickets would harm Herman or vice versa. I thought they should get along although if/when Hermon molted, he would be more susceptible to being eaten or harmed by the other animals. I worried most about the crickets. Then, there was the setup itself. I had a spare 10 gallon tank but wanted to see how things went in the 20 gallon first. The 20 gallon was in the 90's degrees F under the heat lamp but the other parts of the tank, except over the undertank heater in the substrate, varied in temperature so it was closer to 75 degrees F in the front of the tank which was fine for Herman. Because of the temperature gradient, he could move where he wanted to go. The next issue was humidity which is a big issue. Herman had to have high humidity. The heat in the tank and screen lid removed a lot of that. There was a fountain in there so that helped a lot. I also added two fresh wrung out wet paper towels each morning removing the other ones. I got some hermit crab sponges too. On 7/10/07, I made Herman a beach. The beach was a box which was 4.5" x 5.5" x 1.5" deep filled with wet (sand castle consistency) Repti Sand (I had hermit crab sand on order). Each day, I added a little water to that to keep it damp. Herman liked to spend the day in the wet sand and the night climbing around. I made a little dish of saltwater for him too. At night, Herman loved to climb on the anoles' branches and fake plants. It was his joy at doing that that really made me decide to see how things went in the 20 gallon tank before considering setting up the 10 gallon tank and giving myself more work. Hermit crabs should be kept in groups. Herman had no crab buddies but at least had other animals (for excitement) in the 20 gallon tank. 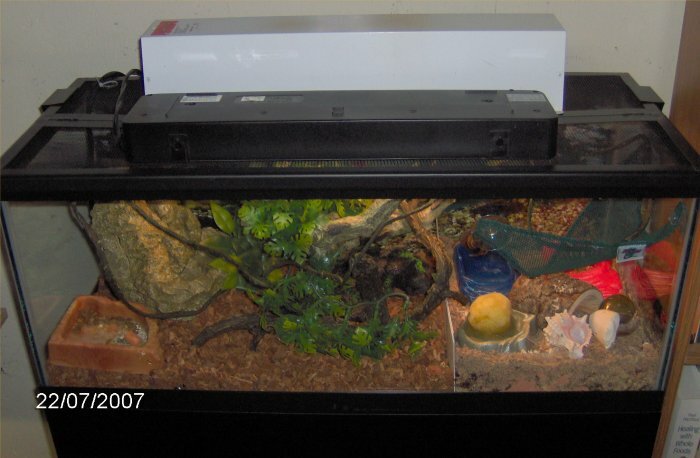 I am sure hermit crabs run across insects in the wild for example so the low levels of bugs in my tank should be fine. Why didn't I get another hermit crab? I am trying to reduce the amount of work I have to do with animals which means I have a rule not to get more animals (which my mother breaks all the time). While I certainly enjoyed Herman, if I had gotten another hermit crab, then every time one would die, I would have to get another in order to always have at least two as they prefer. It would have been an endless cycle all to familiar with other animals that I have had. So, please do not chastise me for getting Herman (I did not) or for his setup as I tried my best to keep multiple animals happy. I feel guilty if an animal is not getting the best care. I tried to think of the countless hermit crabs kept in worse conditions than I had. My great uncle had one alone for a year with no heat source, no saltwater, no fruits and vegetables, no sand, and no lid which was why he eventually vanished. Other people keep them in screen-only cages with virtually nothing. So, Herman had it pretty good in comparison. Herman had a piece of one of his feet missing. I did not know if it was missing when I got him but it was gone the next day. If/when Herman molts, the missing foot should return or at least partially so as they can regenerate limbs when molting. 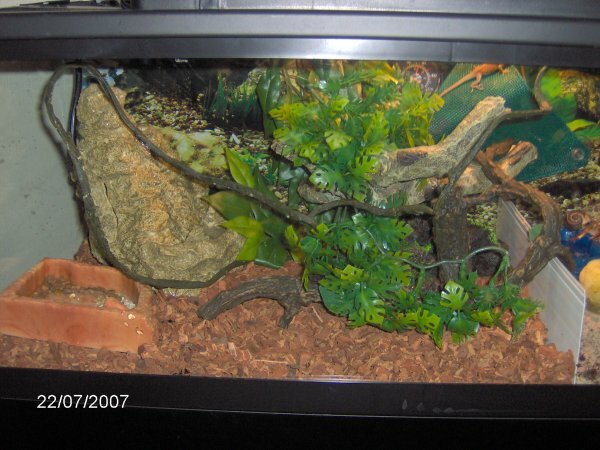 When I cleaned out the 20 gallon tank on 7/22/07, I planned to put up a divider and made about a third of the tank be hermit crab sand mixed with hermit crab soil for Herman and the rest be the Repti- Bark for the roaches and anoles. The anoles stayed up and almost never went on the ground anyway. Sometimes Herman climbed up to visit them. Herman had a saltwater bowl, a freshwater bowl, a food bowl, and a sand box all of his own. It was getting crowded in there! On 7/22/07, I put in the 4" high divider. About 35% of the tank bottom was hermit crab sand and soil while the rest was Repti-bark. The sand was about 2.5" deep after 3 bags of sand and 2 hermit crab soils. A lot of money got us very little depth. I guess it did not matter because Herman climbed out of his section whenever I put him in there and went over to hide in the Repti-bark! So much for trying to make what he likes. I kept putting him back on his beach or in the dishes (of saltwater, freshwater, and food) but he climbed back out. The anoles watched from above but did not go near Herman. The roaches hid in the bark, and I almost never saw them even after dark anymore (the original adults used to come out at night and make a lot of noise running around crazily while courting). Beginning on 7/27/07, Herman started to bury into the Repti-Bark and seemed to be wanting to molt. He would not stay in the hermit crab section of the tank. He came out once a few days later so I put him in the sand but he promptly went and buried himself in the Repti-Bark although his back stuck out. I was misting him twice a day in hopes he would not dry out. I hoped he was just molting. Around 8/12/07, Herman finally discovered his sandy area and stopped hiding in the Repti-bark. He dug all sorts of pits and tunnels in the sand and had lots of fun! He then mostly lived in the sand in tunnels. On 8/23/07, I discovered that Herman discovered the small sundew plant (or rather the pot of dirt) that my mother made me add to the tank on 8/19/07. The dirt was scattered, and the plant not looking too happy. The dirt in the pot was jiggling, and I heard scraping noises. I dumped out the pot; Herman was in the bottom. Then, I had to build some sort of cage to protect the plant. On 9/9/07, Herman finally molted! I had taken him out of the sand the day before to clean the tank. Since he had been hanging out in the sand for more than a month, I did not know when or if he would molt. Here is a photo of his molted exoskeleton. After about 10 days (I put him under the log tunnel so he felt secure somewhat), he started moving around again. I finally found a good snail shell of the right size on 9/18/07 but he wanted to stay in his too small shell. On 9/20/07, I found Herman out of his shell. He was alive but I was worried because they are not supposed to like being out of their shells. He should have moved into the new perfect shell I found but he was just sitting there. Later that night, I found him back in his old shell. He could not retract into it because he was too big but I guess he liked it that way. The night of 9/23/07, I saw Herman in the new shell but he was back in the old shell by morning. On 9/29/07, in the morning, he was again in the new shell and back into the old one by 3 pm. He just could not decide! By November, Herman was not very active. He would sit in a corner for a few days and then in the water for a few days. On 11/20/07, he sat in the waterfall pool. A few days later, he was still there, so the evening of 11/22/07 (Thanksgiving Day), I put him in his food dish. He soon moved over to the salt water (freshly filled). The next morning, his empty shell was sitting in his favorite corner. I checked the other shells, all empty. Then, I looked around for him. I found his poor lifeless body along the back wall. Herman had died during the night. I am not sure why. I tend to want to blame myself although I followed a lot more hermit crab care guidelines than most people. Herman never had a problem with the anoles or roaches (or mealworms and crickets for that matter). His body was undamaged. I think that perhaps the humidity was too low despite pouring water into the sand weekly and mixing it up as well as keeping the dish full of freshwater (added twice a day), the dish of salt water, twice a day misting on him, and the waterfall. I took some photos of him. I will miss Herman but do not plan to get another hermit crab. If I have trouble keeping an animal alive, I will not put another one through that. Herman's favorite thing was eating grapes. Photos are listed from oldest to newest. 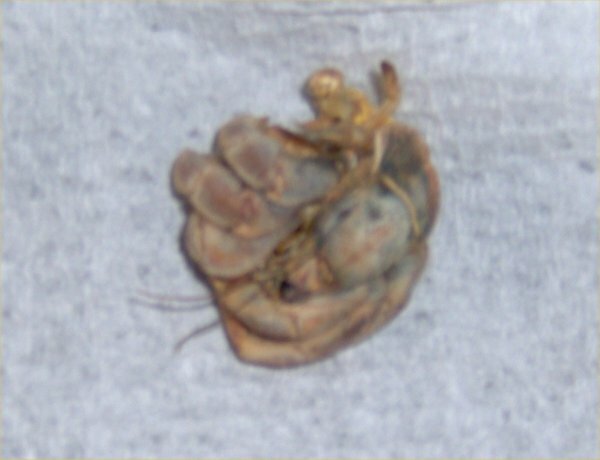 Herman was an Ecuadorian hermit crab. I took these photos on 7/8/07 when he was still in the container my mother got him in. Herman - from the side. I took these photos on 7/11/07 of Herman and the tank he was in. 20 gallon tank - a bit fuzzy but it shows the setup. Herman in his salt water, photo taken from above. 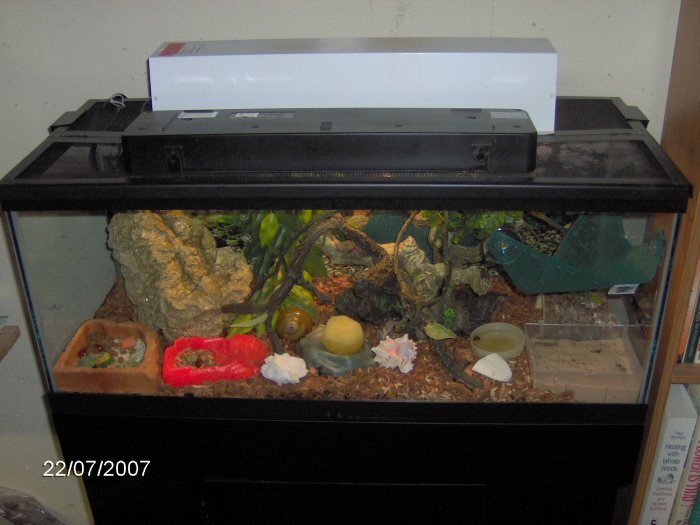 On 7/22/07, I took these photos of the 20 gallon tank before and after I cleaned it and set up a hermit crab section. Herman - close-up of Herman from the last photo. Herman's molted exoskeleton - 9/9/07. Poor Herman died on 11/23/07. I found him deceased out of his shell. Here are two photos of his body. I was surprised how very tiny the part of his body was that was kept out of view in the shell. It seemed to have shrunk since I saw him out of the shell when he molted. 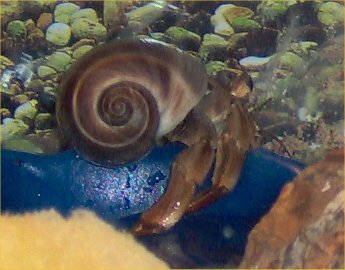 I did not want another hermit crab but my mother did so she came home with one on 12/9/07. This crab had the intensely imaginative name of Crabby! 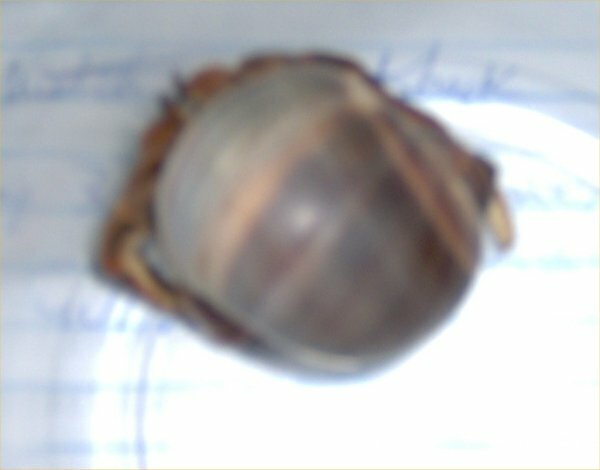 Crabby was a purple pincer hermit crab unlike Herman who was Ecuadorian. Herman had long eyes; Crabby's were round. Crabby's left big claw was blue (purple). I had put all the hermit crab stuff up but pulled it back out for Crabby. Unlike Herman, when I held Crabby, he opened up and walked around which was neat. He was otherwise not doing much. I had yet to see him eat as of 12/13/07. Crabby buried himself into the Repti-Bark in the left side of the tank. The first time he did that, I put him back in the sand and even dug him a pit. 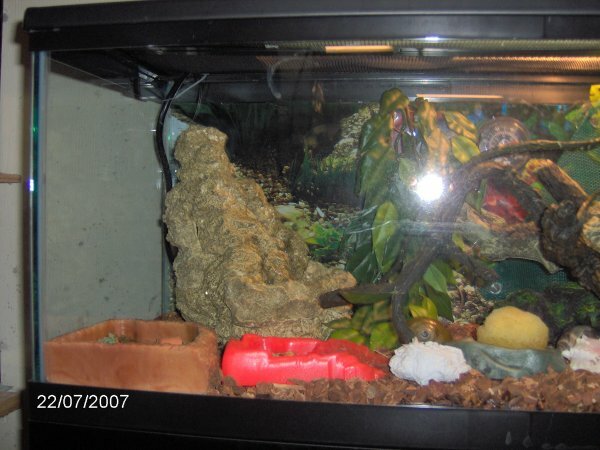 He climbed back out and buried into the Repti-Bark on 12/17/07, and he remained there. I guess he was molting already. 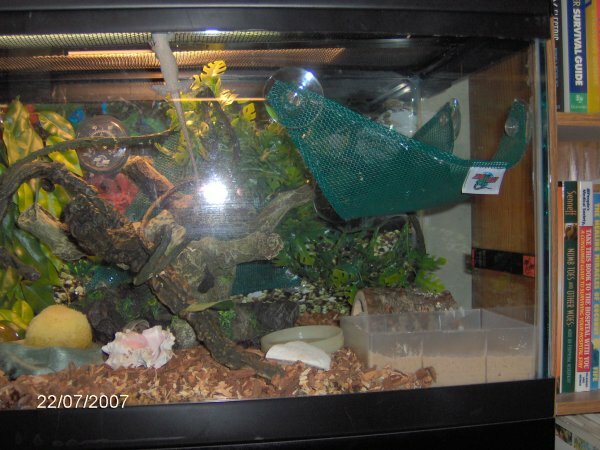 The morning of 12/29/07, I noticed that Crabby was being moved about by the roaches down in the Repti-Bark with him. So, I decided to move Crabby. I added water to the sand area, mixed, and dug him a nice pit which I topped off with a squeezed out wet paper towel. I stuck Crabby in there. He had not moved for a long time but dug himself right out and drove all around. He then ate some food. I stuck him back into the hole. A minute later, he was back into the Repti-Bark at the same spot where he remained as of 12/31/07. His exoskeleton was not yet hazy so I did not know how long he was going to take to finish molting. I had to take Crabby out on 1/6/08 to clean the tank. He seemed fine. When the tank was set back up, he went back into the Repti-Bark. I saw where he was for a few days, and then he vanished. He was in there somewhere but I was not sure where. I would not bother him. He really should have been done molting by then. 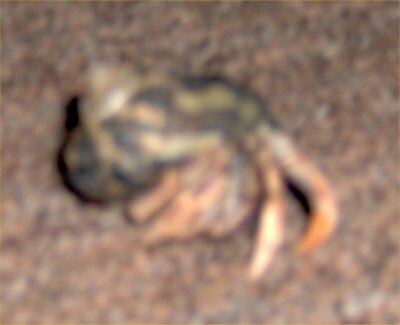 I pulled Crabby out on 2/16/08 to check on him. He was still hiding in the bark. We had had her over two months, and she had yet to do anything but hide. I was worried she would die of starvation and/or dehydration. She still did not have any signs of impending molting such as opaque eyes. I put her with the food and water but she went back to hide in the bark. I was still taking care of the food and water dishes and sand that he did not want anything to do with. On 6/22/08, I decided that Crabby (who was alive and well) was never going to use the sand and hermit crab soil section of the 20 gallon tank. So, when I cleaned it out this time, I did not put back hermit crab sand or soil. Crabby lived in the bark and must have come out at night to eat (or he would be dead by then). I finally saw Crabby out on a day later that week, apparently happy that getting to the crab food and water dishes did not require a crawl across that nasty sand. Crabby was not your typical hermit crab! He had yet to change shells; there were a few nice ones to choose from in there. As of 10/14/08 when I cleaned the tank, Crabby was still okay. I took photos that day. 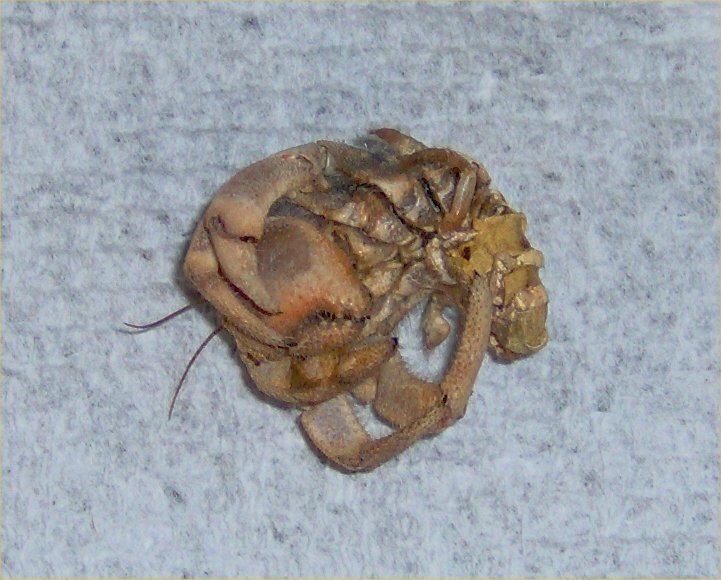 On 12/6/10, I thought Crabby was dead but he had just shed his exoskeleton for the first time that I have noticed for sure. Crabby became a bit more active after that. I put in a little pot with seeds to try to grow them. They sprouted, grew well, and then died quickly. Crabby decided that he liked to dig in the potting soil so I left it in there. 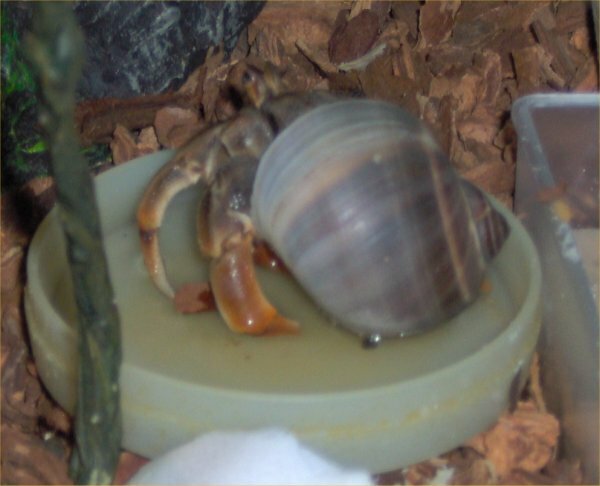 On 3/14/11, I saw Crabby drinking saltwater for the first time. Crabby liked the potting soil so much that I made him a box of half hermit crab fibers and half hermit crab sand and put that in there on 3/20/11. He promptly ran away from it. The box was about 7" by 4" by 3" deep. I used to use this mix (as per advice from hermit crab owners) but he was never interested. On 4/9/11, I found Crabby. He had been dead for a few weeks. He died in his shell, the same shell in which he arrived more than three years earlier. He never changed shells (there were plenty of options). I told my mother not to ever buy another hermit crab because I cannot keep them alive. I cannot control what she does but I certainly will never buy one. Keep in mind that the two I had, she got. So, please do not blame me for being such a horrible hermit crab caretaker. 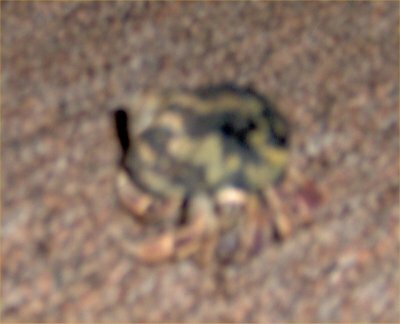 I took some photos of Crabby on 12/9/07 and will post them even though they are not in focus. I took a video too! He was moving fast on the carpet. 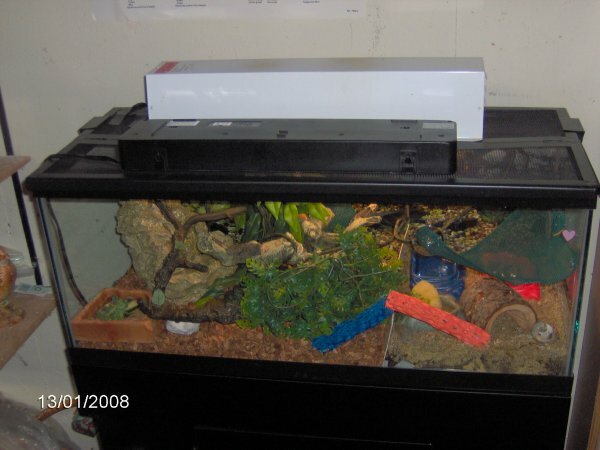 Here is a photo of the 20 gallon tank from 1/13/08.